Today I want to talk about managing auto-replies to email campaigns. What happens after you’ve sent your email newsletter? There are three things to mention when you get a mass of auto-replies flooding into your inbox. 3) how you get the most value out of those replies. Yes, there is value in auto-replies. Firstly, why should you have an email address that you can reply to, as opposed to a no-reply email? 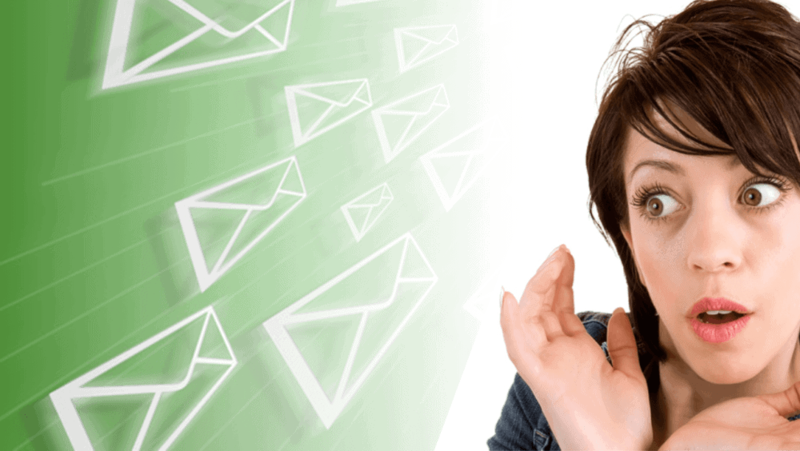 The short answer is… if you send people an email, they expect to be able to reply! So never set up a no-reply email. If you can use a dedicated email address to send your newsletters, that’s brilliant, because it will have a separate reply inbox. One simple approach is to filter by the subject line of your newsletter. You simple set up a rule so that any reply which comes back with that subject header is filed into ‘Newsletter Replies’. Note that you will will have different subject lines each time you send a newsletter, so you’ll have to set up a filter each time you send. If you have a large list, you can set up secondary filters. In addition to your first filter eg. ‘subject line’. Note – If you have complex filtering rules, they are more likely to have some end up in the wrong place. Whether they’re in a filtered folder or a separate inbox, schedule time to look at the auto-replies and do it promptly! Set a reminder for the day after your email campaign goes out. Check carefully as some may be from human beings. People assume they can just hit reply, and some will. These emails are your first priority to act on – obviously depending on what they say. So where do we go next? There’s a whole set of different options, so pick the ones which work for you in your business. Do you have a right to email somebody if it’s not the same email address that initially signed up for your newsletter? A different domain name is at the end of the email address. A company has upgraded their software and/or changed their email address format. In all these situations, if you’ve got a record of the original subscription, and an auto-reply that says please update your records. You’ve got a fairly strong case that you have the right to add that new email address to your mailing list. Bear in mind, if they object they can still unsubscribe. Now, what about somebody who’s left the company? For business-to-business companies, there’s a lot of opportunity here. When someone has left a business, an auto-reply will often have the details of the person who’s replaced them. This time you have no right to add that person to your mailing list. But you have a name and number. So call and introduce yourself. It’s a great time to start a new relationship. If there’s no name on the auto-reply, you can still call. You just ask who’s replaced your original contact. Finally, do you have a good relationship with the person who left? Do you know their personal phone number, or are you connected on LinkedIn and can reach them that way? This person may have an opportunity for you in their new role. Another situation is people may have gone on maternity leave. Once again, there’s an opportunity to phone the alternative contact mentioned in the email and introduce yourself. If you’re using a CRM, you can also remove the person who’s on maternity leave from your newsletter. Then create a task or reminder to add them back to those subscription lists at the time that they come back from leave. You could set a task to phone them upon their return to welcome them back. It depends on what kind of relationship you want to foster. Bear in mind, it’s likely that the new person is not embedded in the traditions and habits of the company. So if you’re trying to get more business, it’s a great opportunity to have a fresh face and to support somebody new. If you’re trying to protect the business, it’s a great time to embed and build and make sure that you’re doing the right thing for somebody new. You’ve probably got an awful lot of these. There may or may not be additional contacts mentioned in this email. Dependent on how you are managing sales communications, you may wish to add those contacts to your database/CRM. Be aware – the Spam Act 2003 states that you need to have express or implied permission to contact somebody with a sales, marketing or promotional email. So you can’t subscribe these people to email or SMS marketing lists, because you do not have permission from them. So call them! Finally, business auto-replies offer useful extra or updated information. Use this to build up your database, especially where people have subscribed online and given very little information. Even just a job title can help with segmenting sales targets. There are software options that you might want to consider to do some of this automatically. There’s one called Siftrock. MailChimp has a paid account feature called Conversations. This filters out automated replies, so you lose the value in them, but it’s an option if you know you won’t have time to process them anyway. More likely in a business-to-consumer environment where there’s less value to be had. Look at which of these options will work best for your business, if you get stuck, let me know. 1) Separate auto-replies out so they don’t get in the way. 2) Make sure you check them regularly so that nothing gets lost or left behind. I hope that helps you get yet more value out of your email newsletter.